A site about "competitive" foods; e.g., my chile is better than yours. Also covering food fermentations; sourdough bread, pickles, cured, and smoked meats, cheese, seafood, and food and foodways. 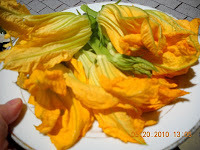 I was shopping at my local ethnic market on Thursday, May 20th and saw some squash flower blossoms. Without hesitation I grabbed a bunch. 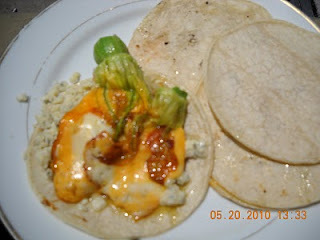 I first learned of this Quesadilla de Flor de Calabaza from Tacos, D.F. and Clara Trujillo. I've posted about her Pambazos before at this weblog. When I saw the flowers, I could not help but think of her and the Quesadillas she offered for $2.00. I don't know the classical Mexican recipe in my head, so when I returned home, netsearching showed the missing ingredient was epazote and I didn't have the right cheese, although that proved to be inconsequential as my recipe below will show. After purchasing the flowers I was off to another market and bought 3 packages of mixed Colby and Monterrey Jack cheese in the snack package size. Those measure about 3/8 inch by 3 inches. Maybe 1 ounce per package. Break up the Gorgonzola with two forks. Add the powdered Parmesan. Mix well. Reserve. Heat a saute skillet and a tortilla skillet. When the saute pan is hot, add olive oil and fry the onion until limp, but not browned. Or until browned. Add the garlic after the 2nd minute of frying the onions. I was too hungry to wait. Add the cheese into the flowers while the onion is cooking. Remove the onion to a bowl or plate. Add more olive oil, allow it to heat a minute. Add the stuffed flowers, saute them a minute and, using tongs, turn them over. Meanwhile heat the tortillas. Add a bit of onion to each tortilla, then add the mixed Gorgonzola & Parmesan cheeses. Using the tongs, place one or two flowers on each tortilla. Cover with the other tortilla. Heat another minute, turn over with a spatula and heat 30 seconds. Remove to a serving plate.